Islamist jihadists killed 14 Syrian intelligence officials Monday in a suicide attack on their offices in the province of Hasakeh. Islamist jihadists killed 14 Syrian intelligence officials Monday in a suicide car bombing attack on their offices in the northeastern province of Hasakeh. The victims were members of state security and military intelligence units, according to sources quoted by the UK-based Syrian Observatory for Human Rights, the AFP news agency reported. “At least 14 members of state security and military intelligence were killed when Al-Nusra Front fighters detonated car bombs in front of the state security headquarters and a military intelligence building in the town of Shahada,” the organization said in a statement. The Al-Nusra Front, listed by the United States government as a terrorist organization, is one of 13 jihadist factions that banded together several months ago to declare themselves to be an independent force from the rest of the opposition fighters. 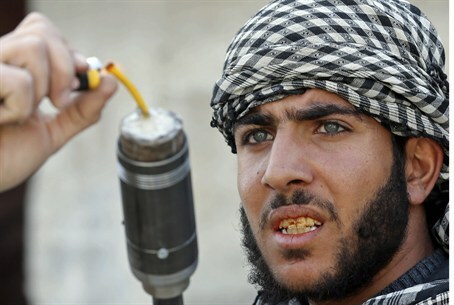 The council of 13 Islamist groups declared Aleppo to be an independent Islamist state in its announcement at the time. The death toll from the twin car bombing is expected to rise in the coming hours, the Observatory warned, due to the large number of wounded, many of whom were in critical condition. Sources in the area said clashes were continuing in the town, while most residents have fled, including a number of employees in a nearby oil field. A separate opposition force also captured the Taqba dam, Syria’s largest hydro-electric dam, on Monday. Opposition groups said entrances and exits to the dam in the northern province of Raqa were in the hands of Islamist rebel fighters, who were warned by their leaders not to remain inside the dam itself, for fear of air strikes by government warplanes. The dam, a strategic target, was completed by the late President Hafez Assad in the 1970s. It was a prestige project at the time, located on the Euphrates River, about 90 miles (150 km) southeast of Aleppo. Rebel fighters also seized three districts in the nearby town of Taqba, home to most of the employees of the dam and their families, according to an Observatory report quoted by the BBC.